COLLEGE PARK, Md. — Companies attending a recent workshop offered a number of technical concepts for reducing the amount of orbital debris, but acknowledged that they lack business plans for carrying out those efforts. “Right now there is no business case for debris remediation,” James Armor, vice president of ATK Spacecraft Systems & Services, said during a Nov. 19 panel session at a workshop here held by the University of Maryland’s Center for Orbital Debris Research and Education (CODER). That view, echoed by others attending the conference, has not deterred companies from developing concepts to reduce the amount of debris in orbit. Several presented debris removal concepts at the workshop, with many focused on moving defunct satellites and upper stages that pose the largest risk for generating debris. Natick, Massachusetts-based Busek Co. Inc., a company best known for its electric propulsion systems, unveiled a concept at the CODER workshop that would use two different spacecraft to move large debris items to graveyard orbits. A large tug, called the Orbital Debris Remover (ORDER), would approach an object. ORDER would then deploy a smaller, tethered spacecraft, named Satellite on an Umbilical Line, to grapple the object. ORDER would then use electric propulsion to tow the object to a graveyard orbit. 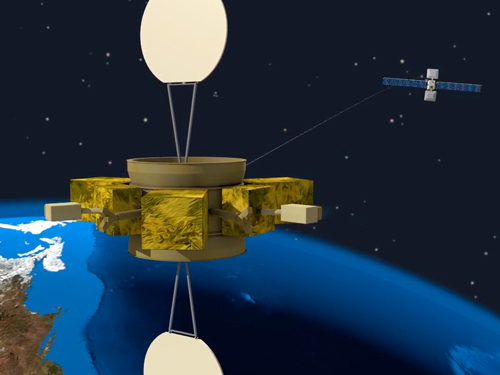 The system would take about two months to move a low Earth orbit satellite down to an altitude where it would quickly re-enter, said Daniel Williams, director of business development for Busek, and a single ORDER spacecraft would have enough propellant to remove more than 40 such satellites, at an estimated cost of $80 million. “To me, that seems like a really great buy,” he said in a Nov. 18 presentation. Moffett Field, California-based Skycorp is developing its own tug, designed to deal with defunct satellites in geosynchronous orbit. Dennis Wingo, chief executive and founder of Skycorp, estimated 550 metric tons of dead satellites are there, posing a risk of collision with other spacecraft. “The probability of a collision is low, but the consequences of one are dire,” he said Nov. 19. Skycorp’s proposed High Mobility Space Vehicle could move up to 20 such satellites into graveyard orbits per year. However, the company has yet to announce contracts with customers for either that application or other satellite-servicing roles, in large part because they have not been economically compelling to operators. “Cost is everything,” Wingo said. Claude Phipps of Santa Fe, New Mexico-based Photonic Associates pitched a concept at the workshop involving a space-based ultraviolet laser. That system, placed in a sun-synchronous orbit, would fire laser pulses at objects in low Earth orbit, pushing them into lower orbits to accelerate their re-entry. Given the lack of commercial markets for orbital debris removal, Armor argued that government incentives are needed to make these or other debris removal ventures economically feasible. That could include direct funding of debris removal efforts, either through contracts or “bounties” placed on individual debris objects. Some, though, remained optimistic that companies will see the economic benefit in paying for debris removal and other satellite servicing applications. “It will happen, when a satellite operator sees a compelling economic value,” Wingo said.